The Rhythm of Ireland hosted their annual feis on Saturday October 18th and Sunday October 19th, returning to Williamsburg after a one year hiatus (held in nearby Portsmouth in 2013). This review covers the morning session of Grades, which featured Beg and Ad Beg of all ages, Novice u10 and below and PW U11 and below. Champs danced Saturday and Nov U11 and older and PW U12 and older all danced after lunch. The Doubletree by Hilton was the site of the feis. It’s a huge venue, with enormous ballrooms and plenty of space for vendors. It’s a very nice hotel and a feis rate was offered. It was nice to have the feis back in Williamsburg. Grades danced on 6 different stages, in 3 rooms. The size of the rooms was plentiful and not once did you feel crammed. The stages themselves, at least in the room my dancer was in were extremely slippery. Never have I seen so many dancers fall or slip. I lost count after 5. That’s five too many. The stages were on the small side and initially they had the dancers dancing 3 at a time. This was a poor move on the part of the feis organizers and thankfully the dances after reel were danced 2 at a time. The feis began on time (8:30 am) starting with figures. Once stages 5 and 6 finished with figures they began Reels, unbeknownst to the kiddos still dancing figures on stages 3 and 4. It wasn’t until all the reels on stages 5 and 6 were completed that they finally decided to get the other stages caught up. They did this by halting all comps on 5 and 6. This oversight did not sit well with many parents. Gladly, they did allow any dancer who missed their reel to dance it without penalty. The stoppage of about 15 minutes could have been prevented had solo’s not begun until all stages were finished with figures. Once stages 5 and 6 re-started they moved quickly through the next dances. Set’s were held up a little while as they had to wait for some comps to finish. The lunch break was listed on the schedule, occurring at approx 11:15 am. Originally the U11 treble reel and U10 PW non trad set were scheduled at the end of the day. ROI responded to emails by moving these comps to the morning, which made more sense. Probably an oversight on their part originally and they corrected the error. The dancers rotated between two stages for core dances. That means they were judged by only 2 adjudicators. We prefer having more than two Adjudicators judge the dancers, but realize this isn’t always possible. Judges were attentive and provided comments. Normally this is where Awards and Results get combined. Not this review. They are each deserving of their own special summary. As usual, the results were turtle slow. And by turtle slow I mean girls and boys completed comps by 11 am and didn’t receive some results until 1:00 pm. No excuses, they messed this one up (again). Score 1. Interestingly Efeis emailed the results posted online results by 4 pm. Never have I been so disappointed with awards. First of all, they only “placed” (meaning you got your name up on the sheet of paper) roughly 40% of dancers. 50% is the norm in our experience. Then, they told the dancers that any place lower than 4th, even if the name was listed on the result sheet, would not receive ANYTHING. So, not only did they place such few dancers (less than 40%), they physically awarded even less. Then, we noticed that those running the scores began to fold over the results sheets so not to show the 5th place and below dancers. I know this because I looked to see what was under the folded part of the paper. And, once efeis put the scores up online, I noticed my dancer always placed well above the 50% mark, but twice was left off the sheet of paper, or the paper was folded over and therefore wasn’t able to receive an award that she earned. By the judges eyes, those dancers were deserving of an award. Purposely not displaying names was a cop out on the part of ROI. Trophies were given for 1-4th place in PW and 1-3 place Novice. We saw plenty of broken trophies which demonstrates the lack of quality. Medals (nice ones with ribbons) were given for 1-3 place in Beg/Ad Beg and maybe some other comps, but by this point I was too tired and frustrated to find out for sure. Set and Treble reel champions received small medals, as did anyone who placed. Out of 20 dancers in a treble reel, only 4 dancers received an award. Set and Treble reel champions weren’t even awarded with a trophy. Most feiseanna recognize these “special” comps with great hardware. The awards had to be the most disappointing experience as a feis parent. Can a WTF reviewer give a score of zero? If so, that’s the score. Plenty of space to camp, and moreover there were a generous amount of chairs to sit. Restrooms were clean and close to the comps. 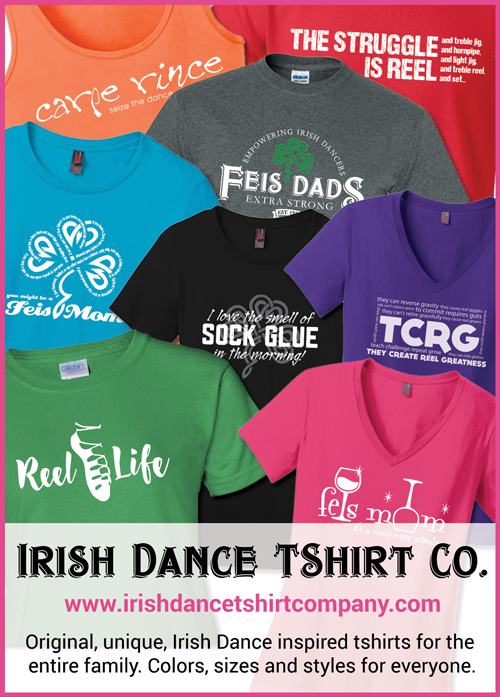 Head for the World, Fab Rince, Goin Feising, Yours truly Photography, Celtic Vine, Earth traditions, Fireball designs, ishopirish. Plentiful and their placement in the lobby area was good. Outside food allowed and of course you could purchase food/coffee at the hotel. Ice cold water and cups were at the back of every ballroom and outside the results area. ROI has a facebook page but didn’t post results or any information during the feis Saturday. They also didn’t post pictures or results from the Champs on Saturday, but they did post information on their FB page as to when comp results would be announced. They could have used social media a lot better and hopefully next year they will. Feis schedule posted early in the week and a competitor list was also published. The results were slow, painfully slow, and not one volunteer could tell us why. The venue is very nice and roomy. Location wise, it’s good to have it back in Williamsburg. The vendors offered lots of selections, important for those shopping for Oireachtas and the school had a raffle table with nice prizes. I don’t want to give this feis a score because I am very upset over the results and awards. But, I want to see what score you give the ROI feis so please vote below and be sure to leave some feedback. After all, a feis cannot improve if they don’t know which areas they were weak in. Well, now it’s your turn, what did you think? Great review! Dead on about awards, whomever made the awards decisions needs a serious reality check. I saw a ton of kids crying everywhere due to being posted but not getting an award. Really, really horrible place to be cheap! I hope they correct this for next year.